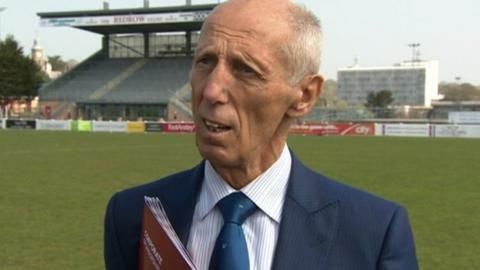 Plymouth Albion chairman Peter Vosper says the club is "more stable" since a new board was appointed last year. The Devon club narrowly avoided going into administration in January 2015 and are playing in England's third tier for the first time in 13 seasons. "We have made good improvements both on and off the field," Vosper told BBC Radio Devon. "I would say that the present position at Albion is that we're in a better state than when we took over." Vosper replaced Graham Stirling as chairman just over a year ago after he stood down from the role. "We are certainly more stable than we were and very happy with the progress that's being made - and again that's on and off the field," he added. Albion have won 11 of their last 12 games and sit fourth in National One. Only the league winners currently gain promotion to the Championship, but Vosper believes that could soon change. "There are many rumours circulating at the moment surrounding the plans the RFU [Rugby Football Union] has for the Premiership," he said. "If they raise the number of teams that will also increase the number in the Championship, with maybe three going up from our division next season. "In planning terms, sport and money go together and the best scenario I see is that there will be some sort of comeback for Albion because of certain suggestions being made."